Interested in eating fresh food on your next thru hike? We enjoy growing and eating sprouts while backpacking and think you may like it too. Here are a few tips for successfully growing sprouts while on the trail. Outdoor Herbivore's trail sprouting in action. See the hanging Hemp Sack? Hanging allows the sprouts to aerate. Growing your own sprout garden while hiking may sound strange, but it is a sensible tactic for acquiring fresh food for an extended outdoor trip in the wilderness. Sprouting is not only easy to do, but it offers a fantastic respite from packaged backpacking food. It satisfies the crispy and crunchy texture of fresh vegetables that you crave after multiple days of eating inert cooked foods. Many thru-hikers worry about getting enough nutrients, especially vitamin C. Some take a daily multivitamin, or consume products such as Emergen C to get the recommended DV. Eating sprouts are another way. Sprouts are one of the healthiest foods available because they are full of living enzymes, contain a spectrum of vital nutrients, including amino acids, phytochemicals, protein, vitamins (A, B, C, E, & K) as well as minerals (phosphorus, iron, silicon, aluminum, calcium, magnesium, sulfur, sodium, and potassium). By weight, sprouting is one of the most nutritious sources of food. Plus, it takes up little space and weight, requires no cooking, and minimal care, making it ideal for carrying out. How easy is it to grow sprouts while backpacking? Very easy. Just start the sprout cycle in the evening (before you sleep for the night). Put 3-4 Tbs of sprout seed into the hemp bag or another medium in water and allow it to soak overnight; if using a bag, place the bag in a dish or cup, then add water over the seeds, and let the bag soak in the water container overnight. The water level should be high enough to fully cover the seeds. In the morning, discard the water and rinse the sprouts with fresh water. Continue to rinse the sprouts each morning and evening with fresh water until the seeds germinate and you are ready to consume. If you can devote a minute to rinsing your sprouts two to three times a day, then you can grow sprouts in 3-4 days. Look for a system that provides excellent air circulation and drainage, which is critical for keeping sprouts moist, but preventing mold. It should allow for light to pass through, be durable, and lightweight. 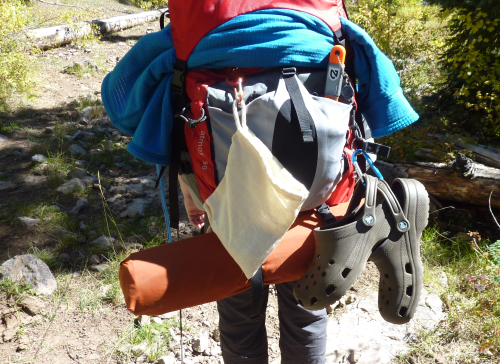 Ideally, you want something you can hang from your pack, so it gets exposure to light and can drip water freely. If you use a container rather than a bag, keep it handy. You don’t want to have to dig through all your gear to tend to your garden. A hemp bag is the best performer for hiking. Outdoor Herbivore's hemp bag is made of tightly woven hemp, allowing the smallest seeds to be sprouted. Why Hemp? Hemp fabric is naturally anti-bacterial and anti-fungal and can withstand harsh conditions for long periods of time. Hemp is one of the most sustainable plants on earth because it can grow rapidly with little water, and requires no pesticides or herbicides. The plant is naturally insect resistant and can be planted densely in low light conditions. So, you can feel good while you out admiring our beautiful earth, knowing you supported this fantastic plant. Get high quality, organic seed intended for sprouting or human consumption. This ensures you are getting the plant you intend to sprout, is non-genetically-modified, and is untreated. Never use seeds that are packaged for gardens/sowing because they may be chemically treated. Many conventional seeds available in stores have been treated with inhibitors to stop the sprouting process. We offer Certified Organic high quality seeds that are tested to perform while on the trail. The technique for growing sprouts requires soaking, draining, and rinsing seeds at regular intervals until they germinate, or sprout (within 48 hours). Day 1: Rinse the seeds to remove any sediment. Discard any seed, seed coating, or sediment that rises to the top of the water. Soak in water for 6-10 hours (overnight). 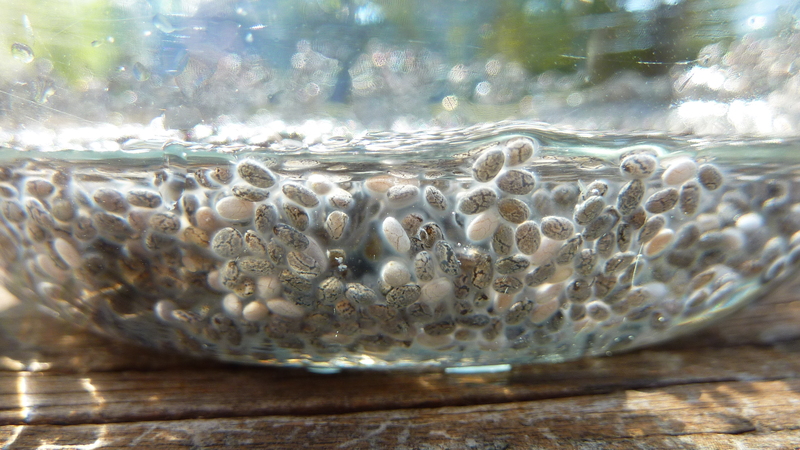 You can soak seeds directly in a cup or immerse the sprout bag in a fresh cup of water. Day 2: Drain the water. Lightly shake to remove any excess water. Thereafter: Carefully rinse the seeds twice daily (morning and evening) with fresh water and shake to remove excess water. Rinsing twice a day prevents the sprouts from drying out. If the air is really dry, you may need to perform a third mid-day rinse. You want to keep the sprouts moist, not wet. Keeping them immersed in water will cause them to rot. Rinse gently, so you don’t break any shoots; otherwise, they can develop mold. They do not need any light at this stage, but exposure to light will not harm them either. Make sure to use treated (drinkable) water to rinse them. It doesn’t take much water to rinse, about ¼ cup. The seeds will begin germinating (first shoots appear) within 48 hours. If you see any green or black fuzz, discard that portion of it so the entire crop does not mold. The appearance of white fuzz is normal - this is the root hairs, not mold. Throw out sprouts that feel slimy. Once the seeds have germinated, they should have a small amount of indirect sunlight. Growing in full sunlight is not recommended because it can cause the sprouts to overheat or dry out. Use a carabiner to secure the hemp bag to the back of your pack to allow the sprouts to get some light and air. Outdoor Herbivore's sprout bag includes an ultralight carabiner which hangs from the drawstring closure. The bag can also be closed by gently pulling on the drawstring. What can I sprout in the hemp bag? Lentils, beans, grains and greens; Microgreens if the hemp material is woven tightly. Sprouting increases the seed volume 6 - 8 times for greens and 2-3 times for beans. 2 - 4 tablespoons is sufficient for a single batch to grow in the quart-sized hemp bags we supply. How soon can I eat my sprouts? You can consume the sprout as soon as the first shoot emerges. Depending on the type of sprout you are growing, the shoot will appear as soon as 48 hours after soaking and rinsing the seed. It will have a grainy/chewy texture but is easily digestible. Salad-type sprouts such as alfalfa, broccoli, clover, radish, etc. are usually grown to a more mature leaf stage which takes about 4 days. Taste sprouts at different growing stages to determine your preference. We like to eat greens after 4 days and beans after 2 days. How can I serve sprouts? Eat them raw as a salad, add as a topping to a dish, or cook them. We like to make a hummus taco and use sprouts as the lettuce. Some people prefer to lightly cook the bean sprouts. For example, mung beans are often sprouted then cooked. Some of the nutrients will be lost by cooking; however, more vitamin content is retained versus straight cooking without sprouting. Grow a mixture of different seeds for optimal flavor. Alfalfa, broccoli, radish, clover, and mung bean make a nice mix. This mix tastes wonderful as a salad with a drizzle of olive oil for added calories. It also makes an excellent filler for tortillas and a satisfying topper for soups. We suggest having 2 bags (one as a backup container) so a new batch can be started once the first batch has germinated. The best place to store the batch in the absence of a refrigerator (i.e. while hiking) is in the hemp bag. Make sure to keep it moist so it does not dry out. Trails such as the AT are located close enough to civilization that you can get some packaged convenience foods. However, there are not many convenient choices for getting fresh food. Sprouting is a sensible way to supplement your food supply. Growing your own food, in addition to having a majority of your food items pre-packed, means less time grocery shopping in town and more time resting up for the trail. Follow the steps above for successfully sprouting while on the trail. For shorter hikes, you can start the sprouting process at home (2 days prior to your hike). They'll continue to grow for the duration of your hike with the proper care. Since sprouting is a live food, it will continue to grow very slowly for several days after it is suitable for consumption. So if you wish to stop somewhere for several days to resupply/rest, the shoots will continue to produce. Sprouts can stay fresh for 1-2 weeks (up to 3 weeks if refrigerated); however, the best time to eat them is within a week since the highest levels of enzymes are present during this time. As an added benefit, many people assert their digestion is improved with sprouts. This could be attributed to the beneficial enzymes that are naturally present in them. 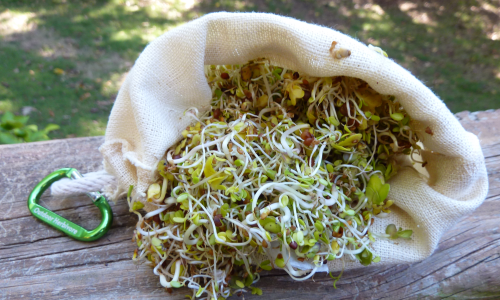 Try growing sprouts on your next long hike and let us know what you think! Outdoor Herbivore's hemp material is natural and unfinished. Pigments of some sprout seeds, such as adzuki & red clover may cause the sprout bag to discolor. This is normal and will not impact the performance of the bag or sprouting. You can wash sprout bags by hand with mild soap and hot water, or machine wash on the gentle cycle. Air dry or tumble dry low.